The largest national forest in the east, the 1.1 million-acre George Washington National Forest in western Virginia and West Virginia has been a favorite destination for generations of outdoor enthusiasts, from hikers and campers to hunters and horsemen. These public lands are also a haven for wildlife such as black bear, songbirds, native brook trout and many other species, and are the source of clean drinking water and economic benefit for dozens of communities. The George Washington National Forest (GW) is managed by the U.S. Forest Service, which released a long-term management plan for the forest in 2014 to guide virtually all activity in the forest for at least the next decade. 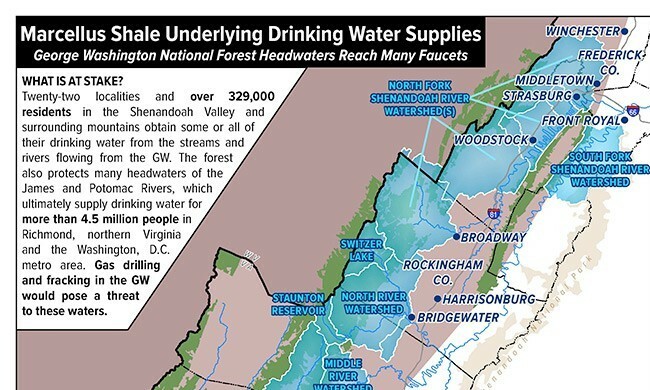 Despite the extraordinary environmental, economic, and recreational role the GW plays in our region, the Forest Service was weighing whether to open these public lands to gas development and high-volume hydraulic fracturing—“fracking”— a risky form of drilling that entails injecting huge volumes of water and chemicals into the ground in order to extract natural gas from shale deposits. Fracking involves intensive industrialization of land, including drilling pads, containment ponds, storage tanks, roads and heavy truck traffic, and more. One of the country’s most popular national forests is absolutely the wrong place for gas drilling and fracking, so SELC and our local, regional, and national partners worked relentlessly to persuade the Forest Service to keep this area off-limits to fracking, as did local governments and communities surrounding the forest. We’re pleased to report the Forest Service agreed and made the forest unavailable for oil and gas leasing and drilling, except for a small portion already subject to gas lease or private rights, a decision that protects the existing uses and values of the special George Washington National Forest. Forest plans also may make recommendations for to Congress for the designation of additional, permanently protected Wilderness or other designated areas. SELC, Virginia Wilderness Committee, and other local organizations applauded the GW plan’s recommendations for the designation of 27,000 acres of new or expanded Wilderness areas and approximately 70,000 acres of scenic area in the landmark Shenandoah National Scenic Area. We and our partners will continue to work with the Forest Service, local citizens and communities, and other stakeholders with diverse interests towards the designation of these areas. As the Forest Service implements the new forest plan, SELC and our partners will continue to press for the protection of clean water, thriving fish and wildlife populations and ample, healthy habitat, old-growth forests, and prime recreation spots, including remote backcountry areas.